Aerial Refueling System Market size was over USD 2 million in 2016 and is estimated to exhibit approximately 3% CAGR from 2017 to 2024. High acceptance from military sector coupled with increasing defense budgets of various countries across the globe will primarily drive the industry growth. The high defense budget has resulted in substantial demand for tanker aircrafts, especially in developing countries, further impacting the industry positively. In 2017, the defense budget of India was around USD 55 billion which was 7% rise from the previous year. Similarly, China’ defense budget rose by 7% in 2017 to USD 151 billion. This has strengthened the spending power of developing countries, inducing immense potential to the market till 2024. Demand for special purpose military jets has witnessed a considerable rise over the past years. Moreover, emergence of multi-role aircraft tankers and their extensive usage owing to the benefits such as less fuel consumption will escalate the revenue generation. However, high incidences of accidents during refueling procedures may pose a challenge before the market participants. Downside of boom mechanism such as high requirement of reducing the pressure while filling the combat aircraft will restrain the industry growth over the next eight years. Moreover, this mechanism is not compatible with the helicopters, negatively impacting the industry penetration. Aerial refueling systems market players are continuously focusing on R&D activities to overcome the challenges of complicated refueling procedures during extreme weather conditions. Emergence of smart drogue system has gained prominence among the industry participants. It is featured with sensors and connected to existing hose that continuously regulates the basket movements. It acts as an active buffer and leads to a considerable reduction in its movement. Moreover, it results in uninterrupted refueling even in harsh situations such as intense turbulence and rough air. These innovations are likely to provide stable growth prospects to the industry size till 2024. Several market participants are involved in agreements and contracts with air force to enhance their visibility and gain competitive edge. For instance, in 2011, Boeing signed a contract with U.S. air force to acquire 179 KC-46A tankers to prepare for the war fighter needs and re-capitalize its ageing fleet. The established industry participants are likely to respond to these emerging trends by offering long-term service support coupled with regular advancements for capturing new business opportunities. Aerial refueling system market from military aircraft is anticipated to showcase dominance, accounting for USD 2.4 million by 2024. Extensive usage of these system by military sector across the globe will primarily contribute towards the substantial revenue generation. Rising defense budget of various countries across the globe will further support the industry dominance. Helicopters will grow substantially over the next eight years owing to their rising usage of refueling system. Helicopters possess low fuel carrying capacity than other combat or commercial aircrafts. Commercial aircrafts are likely to account for USD 4.5 thousand till 2024. High usage of these system for ensuring uninterrupted flight will majorly drive the industry growth. Drogues are likely to grow substantially, witnessing over 3% CAGR from 2017 to 2024. Manufacturers are extensively using probe and drogue system for aircraft refueling owing to its advantages. This has resulted in their high production, positively impacting the market. Moreover, high usage in helicopters will further escalate the revenue generation over the next eight years. Refueling pods accounted for highest revenue share in 2016 and will continue the same over the next eight years. The high prominence is attributed to its vital functionality of regulating the fuel transfer rate. Probe and drogue system acquired maximum volume share in 2016 and is likely to continue showcasing their dominance over the forecast timeframe. This system allows more passive operation for tanker system as compared to the counterpart. Moreover, they are the most practical system for UAS tankers since they do not require tankers to precisely direct the drogue. These benefits have forced the manufacturers to prefer this system over the flying boom mechanism, supporting the market share from 2017 to 2024. Aerial refueling system market from flying boom system will exhibit over 4.5% CAGR till 2024 owing to strong prevalence in the industry over the past years. Conventional tankers such as KC-135R and KC 135 are equipped with flying boom system. Moreover, this system has high fuel transferring rate than the counterpart, further strengthening the industry penetration till 2024. OEMs will dominate the market with over 90% share over the coming years. These systems are already installed in the aircrafts, for refueling procedures. Substantial growth in aircraft deliveries across the globe will contribute significantly towards the high revenue generation. Aerial refueling systems market from aftermarket will grow significantly, exhibiting 4.5% CAGR till 2024. High requirement of replacement of integral components of these system such as refueling pods and drogues, especially in ageing aircrafts will contribute to the growth of aftermarket over the coming years. Moreover, rising need of advanced refueling system will further propel the industry growth. North America aerial refueling system market is expected to capture the highest revenue share, crossing 50% over the forecast timeframe. Substantial aircraft deliveries coupled with presence of multiple variants of refueling tankers such as KC-130, KC-135, C-160 NG, etc, especially in U.S. will primarily contribute to the revenue generation. Moreover, presence of established industry participants such as Lockheed Martin and Boeing will further support the regional dominance. Rising defense budget of the U.S. is another factor positively impacting the regional growth. Asia Pacific market size is likely to grow rapidly, witnessing nearly 2% CAGR from 2017 to 2024. High product demand from countries including Japan, China, and Australia will essentially drive the industry growth. These countries are increasingly acquiring refueling tankers owing to high aircraft production, further inducing immense potential to the industry size over the coming years. 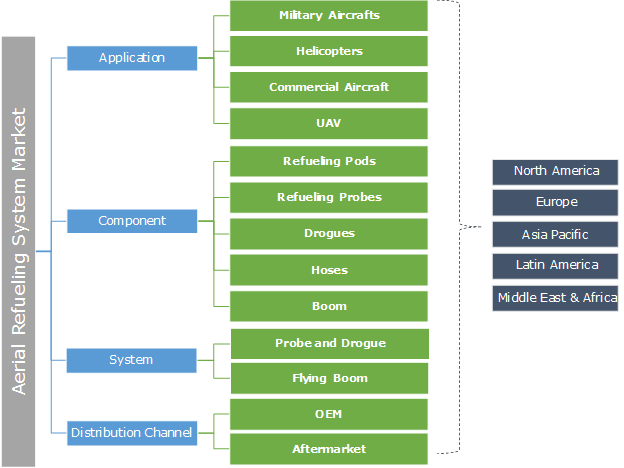 Cobham PLC, GE Aviation System, Boeing, Lockheed Martin Corporation, Dassault Aviation, Eaton Corporation, Zodiac Aerospace, and Marshal Aerospace & Defense Group are among the noticeable participants in the aerial refueling system market. The industry is likely to witness immense competition owing to adoption of aggressive strategies including mergers & acquisitions, agreements, and new product development by the competitors to gain high visibility. For instance, in October 2017, Cobham entered into a long-term supply agreement with Icon Aerospace Technology for its in-flight refueling hoses across various aircraft platforms. In December 2017, Boeing introduced a self-flying aircraft for refueling the military aircrafts in mid-air that was designed as a part of competition held by U.S. Navy. This product development helped the company in capturing considerable market share in the market and expand its product portfolio. Aerial refueling is majorly defined as a process of transferring the aviation fuel within aircrafts during the flight modes. Probe & drogue and flying boom are two methods for carrying out the aerial refueling processes. These systems are increasingly gaining prominence, especially in military sector, wherein extra fuel received can result in unwanted delays in the flight durations. High acceptance from military sector coupled with rising demand for uninterrupted flight time will drive the market growth. However, excessive costs coupled with complex refueling techniques may pose a threat to the industry participants over the coming years.